Skip header and main navigation. Skip to main content for this page. Many major pharmacy chains offer savings programs which can significantly reduce the cost of select prescriptions. Some of these programs have annual fees, some are free to join, and some simply offer low cash prices that don't require any membership. Learn more. In an average month, GoodRx saves over 4,000,000 Americans more than $416 million via our free discounts and coupons. I don't see my pharmacy! Not to worry! GoodRx only displays the names and locations of pharmacies approved by a nationally-recognized professional organization that works to ensure public health and patient safety. You can still find a coupon that works at unlisted pharmacies at the bottom of our price pages (though prices may vary). These 20 cities have the most pharmacies listed on GoodRx. 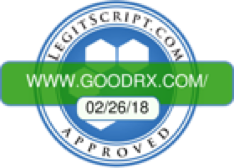 GoodRx adheres to quality standards established by a nationally-recognized professional organization that works to ensure the public health and patient safety. As such, GoodRx only displays the names and locations of pharmacies that have been approved by this organization. Download the GoodRx App Now! Let us text you a link to download our free Android or iPhone app! Enter your email here to sign up for the GoodRx newsletter. By providing your email address, you agree to receive emails containing coupons, refill reminders and promotional messages from GoodRx. You can unsubscribe anytime. GoodRx provides no warranty for any pricing data or other information. We are not sponsored by or affiliated with any of the pharmacies identified in our price comparisons. All trademarks, brands, logos and copyright images are property of their respective owners and rights holders. All data provided is for informational purposes only and is not meant to be a substitute for professional medical advice, diagnosis or treatment. Please seek medical advice before starting, changing or terminating any medical treatment. In all states except Tennessee, GoodRx is considered a marketer of prescription discount cards. In Tennessee, GoodRx is registered as a Prescription Drug Discount Plan Operator. GoodRx works to makes its website accessible to all, including those with disabilities. If you are having difficulty accessing this website, please call or email us at (855) 268-2822 or legal@goodrx.com so that we can provide you with the services you require through alternative means.